This book is a pioneering work, showcasting Christian themes in Indian art from the beginnings of Christianity in India till today. The authors have, in the main, dealt with paintings and sculptures, but have supplemented this with one chapter on architecture, particularly that of church buildings, and one on popular art, including stamps. Around 1,100 rare colored illustrations make this publication a unique reference book. It is the first complex treatment of the theme done in the last 25 years. 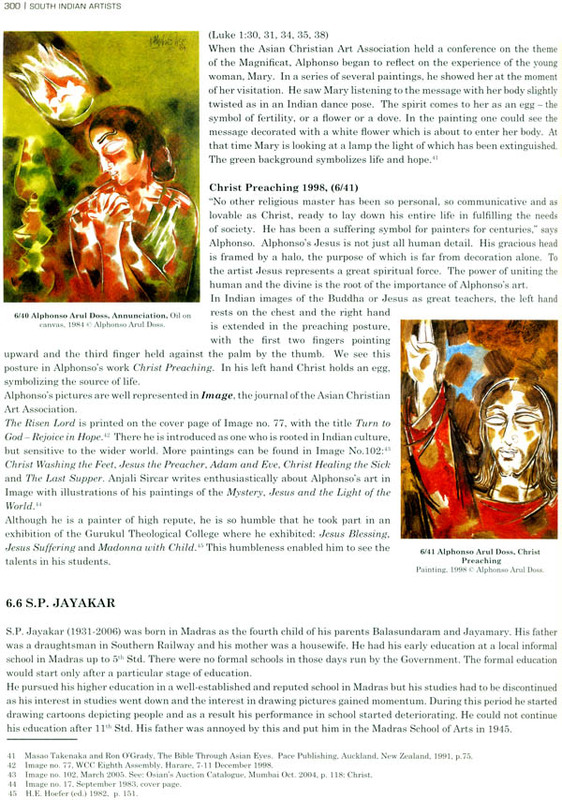 Special emphasis is given to artists who as Hindus, Muslims and Parsees have chosen to paint Biblical themes. Already in the 16°’ century the encouraging and surprising encounter between European Christian prints and Indian miniature paintings took place. The Muslim Emperor Alcbar invited three Jesuit missions from Goa to the Mogul court. 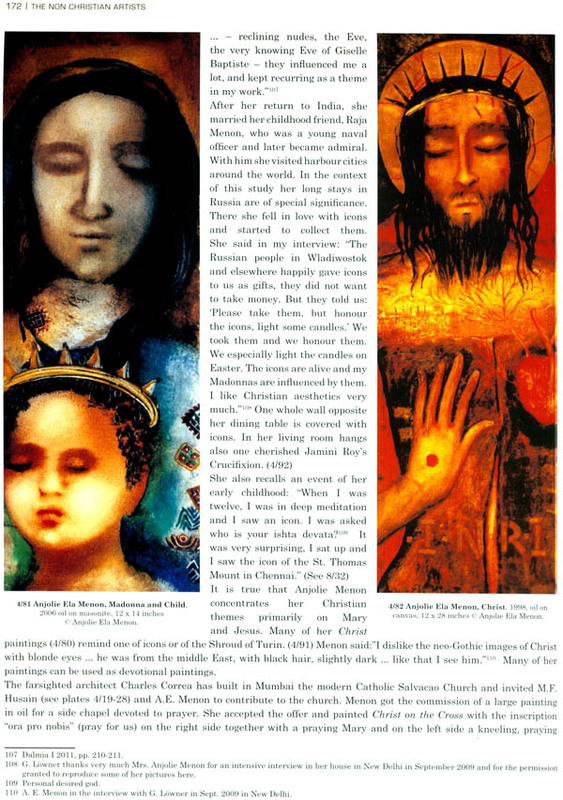 Fascinated by European Madonnas and engravings, especially with Christian themes, he ordered his painters to copy them in various ways. This was the start of a revolutionary fusion in Indian miniatures. 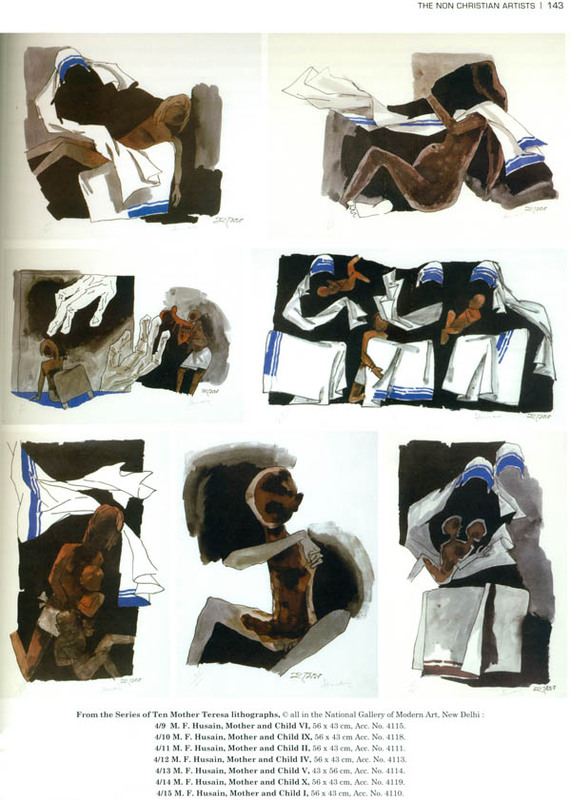 Most of the Bengali artists who were chaptered by the human God Jesus and his agony are Hindus like Nandalal Bose, Jamini Roy, Nikhil Biswas, Arup Das, Suhas Roy, Suman Roy, Sudip Roy etc. The authors always give a short biography and then highlight his/her works connected with the theme. 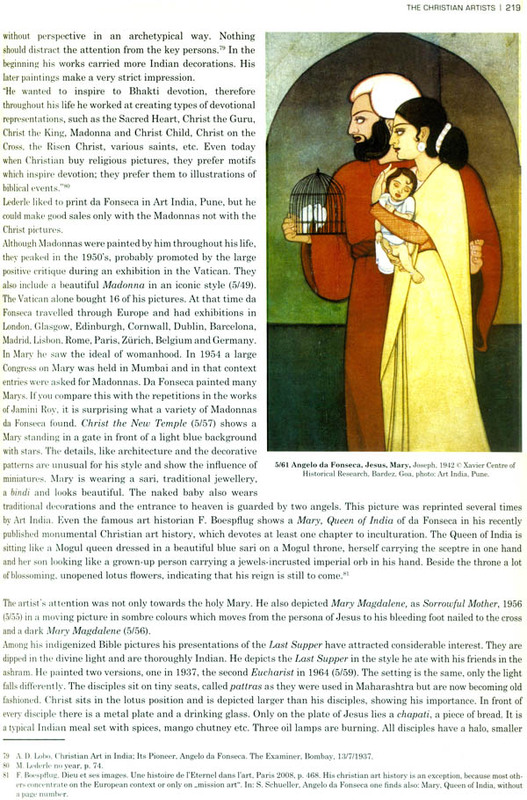 The late Muslim M. F. Husain, whose faceless Mother Teresa pictures became icons, is presented side by side with his close friends, the Hindu Krishen Khanna, the Parsee Jehangir Sabavala, the Hindu artists Satish Gujral, V. Nageshkar, Anjolie Menon, Ramachandran and the Sikh sisters Amrita and Rabindra Kaur Singh. The Who is Who of Indian art history is presented from a new angle. Christian artists include the late F.N. Souza, who simultaneously hated and loved his Christian childhood God, and artists like A.D. Thomas, Angela Trindade, A. Fonseca, V. Masoji, F. Wesley, C. J. Anthony Doss, Alphonso Doss, S. Raj, and J. Sahi, all who stand for the attempt to incorporate the Christian gospel into the Indian culture. This original research includes many young talents. An extensive Bibliography, Glossary and Index make this book a real reference source for many years to come. Anand Anakadass SJ Studied philosophy and theology. He took a master’s degree in Sanskrit and a Ph.D. from the University of Madras in 1981. sinc e1984 he is teaching at Satya Nilayam Jesuit faculty of philosophy in Chennai now part of the Loyola College, Chennai. He was dean of the faculty and director of the research Institute for Philosophy and Sanskrit. Since his poet doctoral studies at the Vienna University. Austria in 1982-1984 he has taught nearly every year as a visiting professor during the summer terms in Vienna. He has also been visiting faculty at the Wurzburg University Germany and the Greogrian University in Rome. His area of research includes Indian Philosophy and religion aesthetics and interfaith dialogue. More than 40 books have been written or edited by him including a publication on the Dhvani theory in Indian Aesthetics and four in the German language on various Hindu gods and Goddesses. He has also published around 100 articles in English and in Indian books and journals. Amaladass was founder editor of Satya Nilayan Chennai journal of intercultural philosophy and was co-editor of the journal of Christian Hindu Studies for 20 years. Gudrun Lowner studied protestant theology and comparative religion in Bochum. Wuppertal, Geneva and Heidelberg. Her Ph.D. was from Heidelberg University in 1997after intensive field studies in Sri Lanka. Her thesis has the title Religion and development in Sri Lanka. She came to India after working in a centre of intercultural Encounter in Herne. Her studies were supported by the Fritz Thyssen foundation in Cologne, Germany. In 2008 she received the order of Merit of the staff of the protestant university of Wuppertal, Germany. 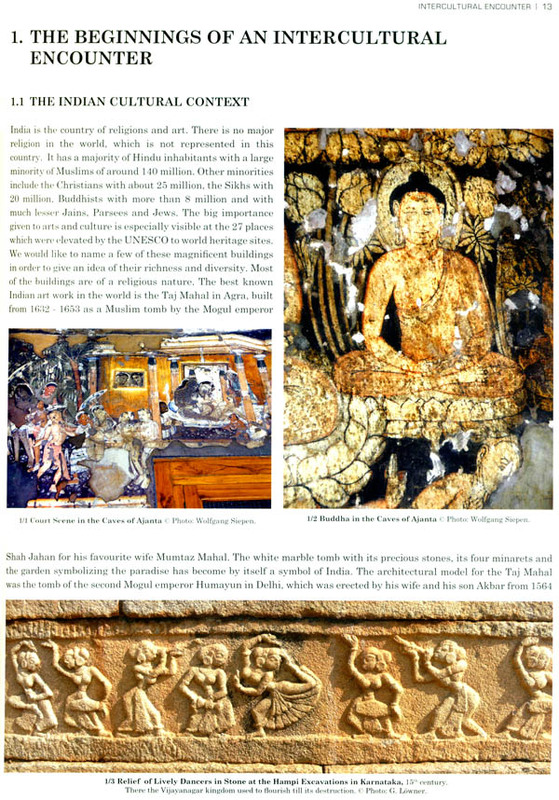 Her areas of research include Buddhism India and art. She has published her thesis and coauthored with Petra Kaupp a book studded with beautiful pictures on India Schatztruhe Indian New Delhi 2005. her recent book Christliche Themen in der indischen Kunst Frankfut 2009 is an abridged version of the present volume which is presented here totally anew together with more than 1100 rare illustrations. 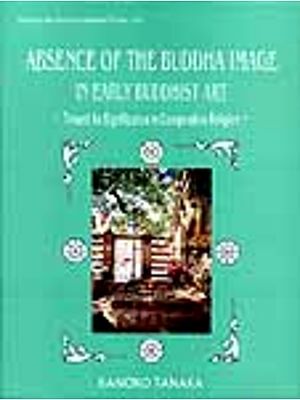 The two authors of this book met for the first time at a Conference of the Indian Christian Art Association in Bangalore in 1986, where they presented papers. Later they lost sight of each other and met again in 2006 on the occasion of the Max Mueller Bhawan conference to commemorate the 300th anniversary of Bartholomaus Ziegenbalg’s (the first German Lutheran missionary) arrival in Tamilnadu, held in Chennai. 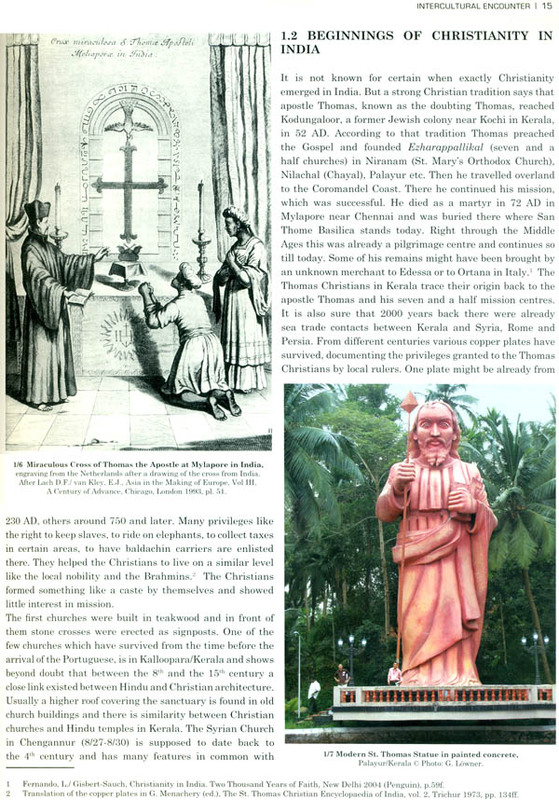 Independently of each other both had cherished the dream of writing a book on Christian art in India and had already collected some material for such a big project since for more than twenty years no comprehensive book has been attempted in this field. The coming together for the Conference in Chennai gave the opportunity to discuss and decide on writing this book. 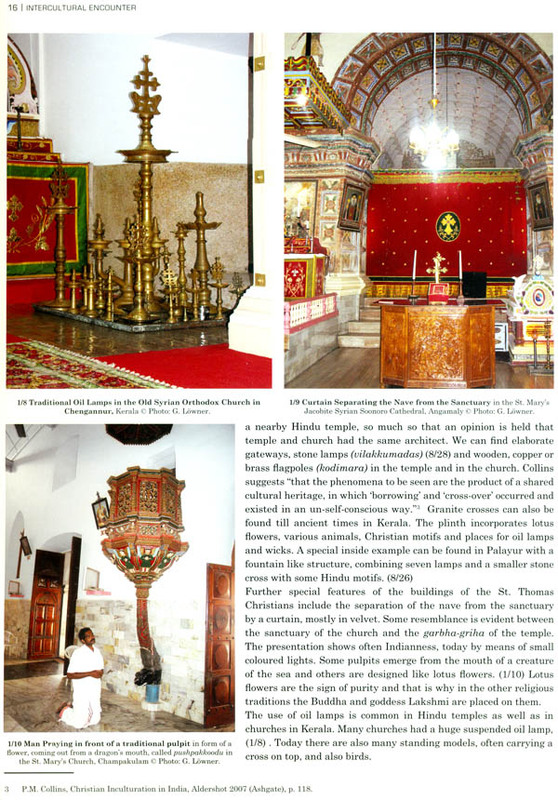 This publication belongs into the context of the contextualization debate in the Indian churches. In art the whole debate of liberation and enculturation becomes visible in an integral way. Sometimes the arts show a prophetic way and express new ideas before they become written theology. At first both of us concentrated on Christian artists producing Christian art. 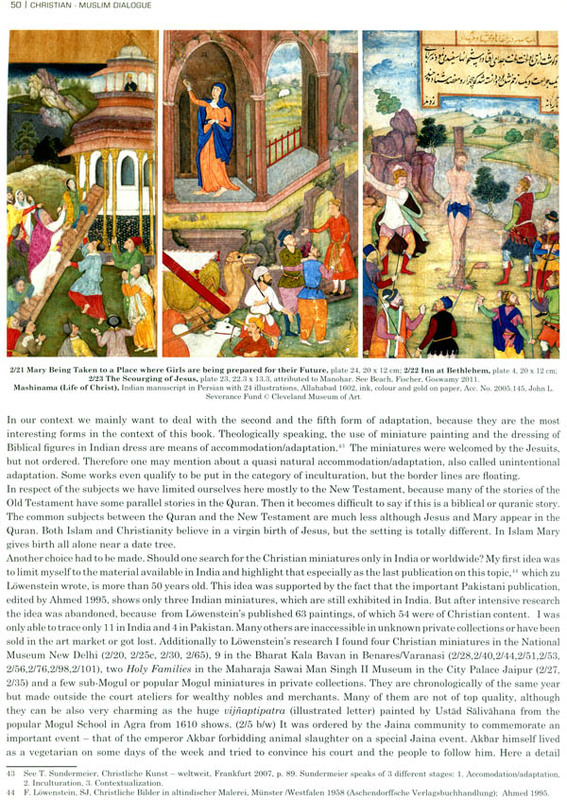 As only a tiny minority of 2 - 3% of Indians are Christians we thought that the works of Christian art must be rather limited, because during the British period the East India Company and the British colonial power did not support the work of the missions in a big way. 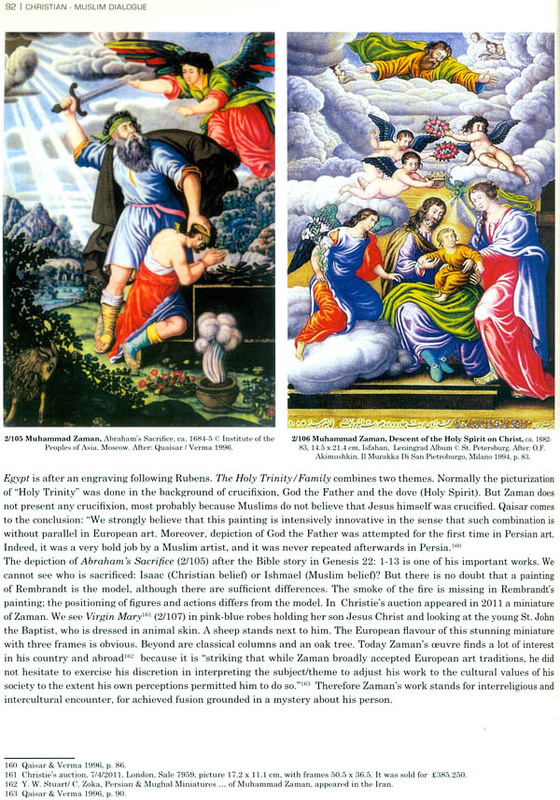 And it is also true that most of the Christian art of the early colonial period was limited to church buildings and paintings where western models were copied. But there is a surprisingly different reality, which can be discovered. 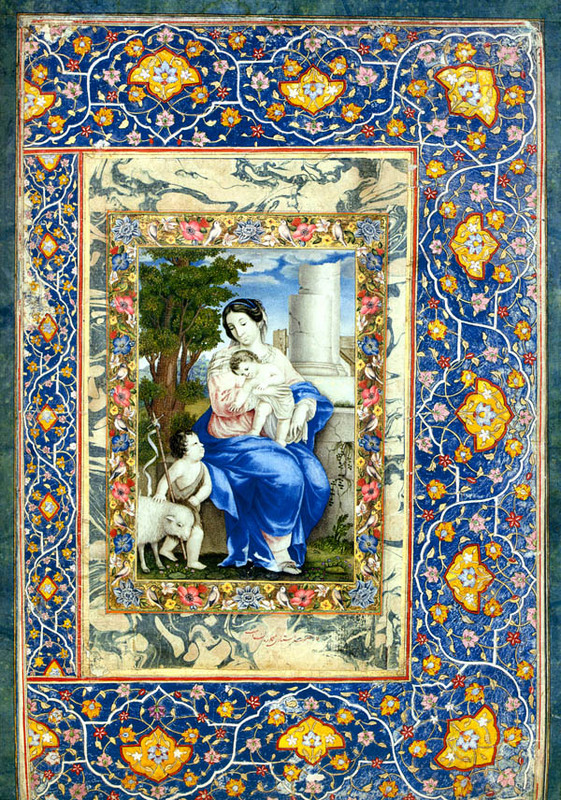 Already at the court of the great Muslim Mogul emperors in India Christian miniatures were painted, copying the themes from engravings, which the three Jesuit missions had brought with them from Europe. These miniatures were part of a very interesting interreligious and intercultural integration, which started in 1580 and is well worth to he remembered. Moreover, in the Bengal art scene of the 19h century till the middle of the 20nh1 century, the national struggle for India’s independence was beginning to take root. There the figure of Christ played an important role. The suffering and dehumanized people identified themselves with Christ. 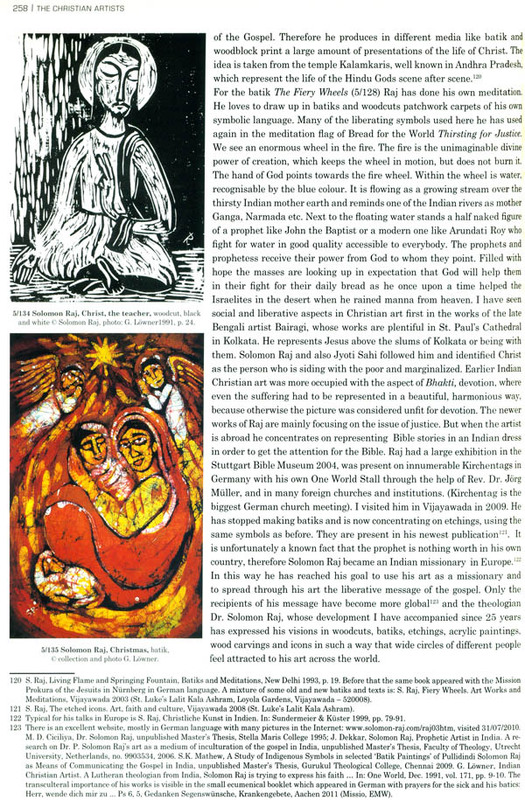 Whereas in the European modern art market Christian topics have been pushed to the periphery — except artists like Marc Chagall — they are surprisingly present everywhere in the mainstream art market in India, and that too in a mainly. Hindu country. 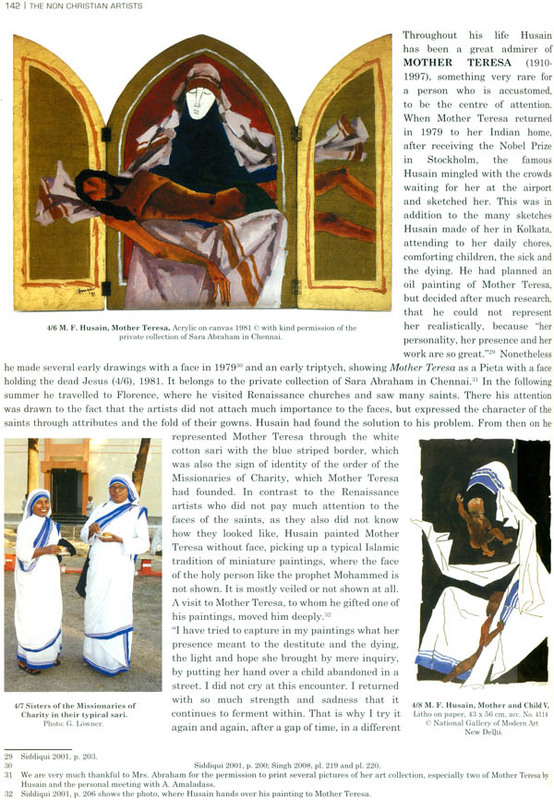 Most of the important persons of the modern Indian art history have at least painted some Christian themes, some have even dedicated a large part of their works to a religion, which is not their own. In this hook we want to attach special importance to these non Christian artists and their works. 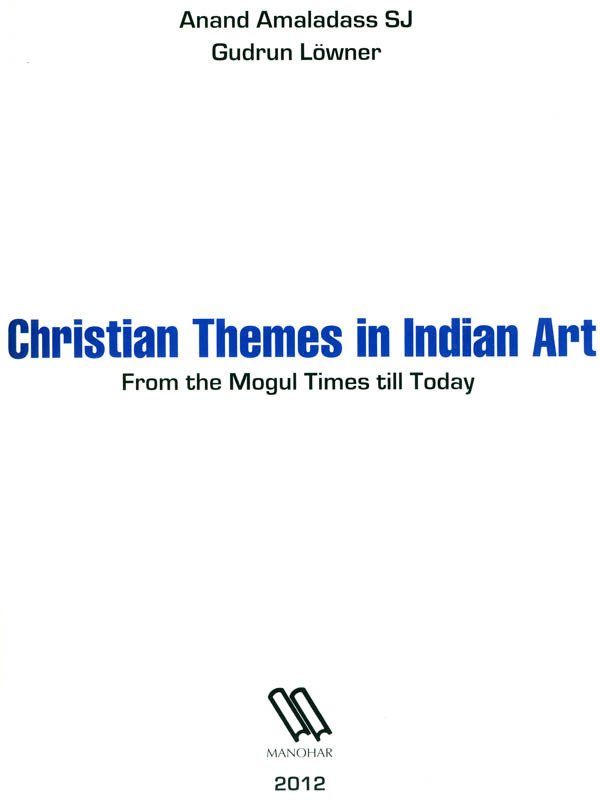 In order to do justice to these Hindu and Muslim artists we have decided to have the title Christian Themes in Indian Art for our book as a more neutral title and not Indian Christian Art. Finally it is left to the discretion of the viewer, whether he/she considers an art work to belong to the Christian tradition or not. Jyoti Sahi and others are right, when they say that a landscape or a flower pot can be more religious than a saint who is painted according to strict rules.’ However, as the available material is extremely vast, we had to make a choice. 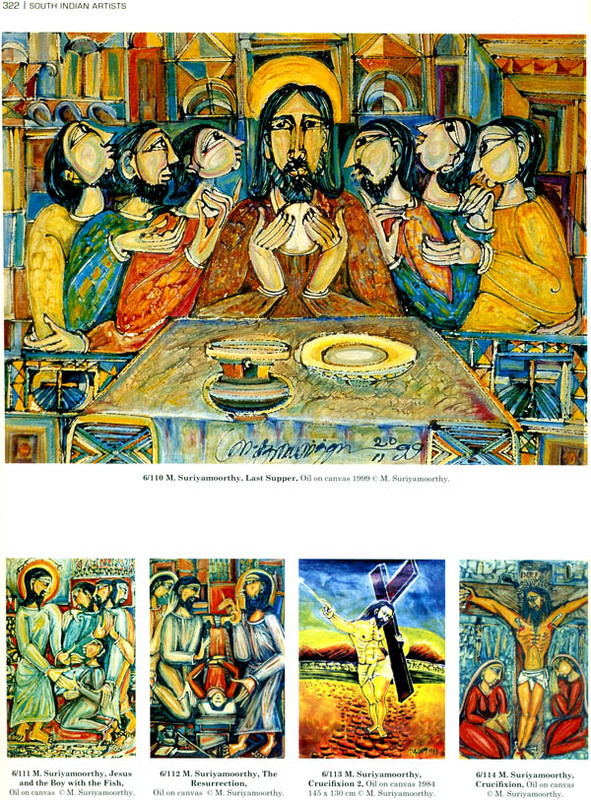 Therefore we gave preference to art works where Christian content is explicitly seen and neglected for example the abstract paintings of the deeply religious Muslim artist Sayed Raider Raza (born 1922). His Bindu-art reminds us very much of mandalas. which have a geometrical, universal, mystical religious dimension, where Christianity could also be included. We also left out the Dalit art, which is a new emerging art and as a subaltern protest art needs its own platform. The Tamil Nadu Protestant Theological Seminary in Madurai is already giving publicity to this art2 and arranging workshops. 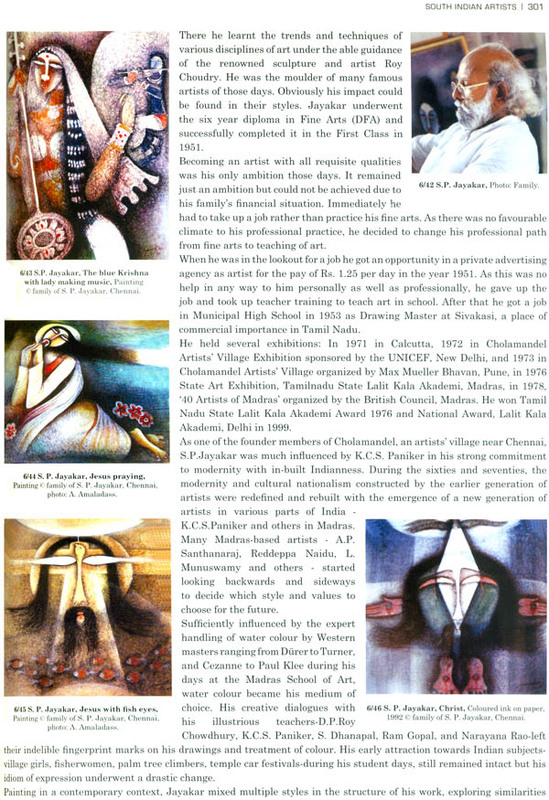 The Tribal or Adivasi Christian art is in a developing stage. This book already touches upon this area, but more research can be done in this field and will be taken up in the future. 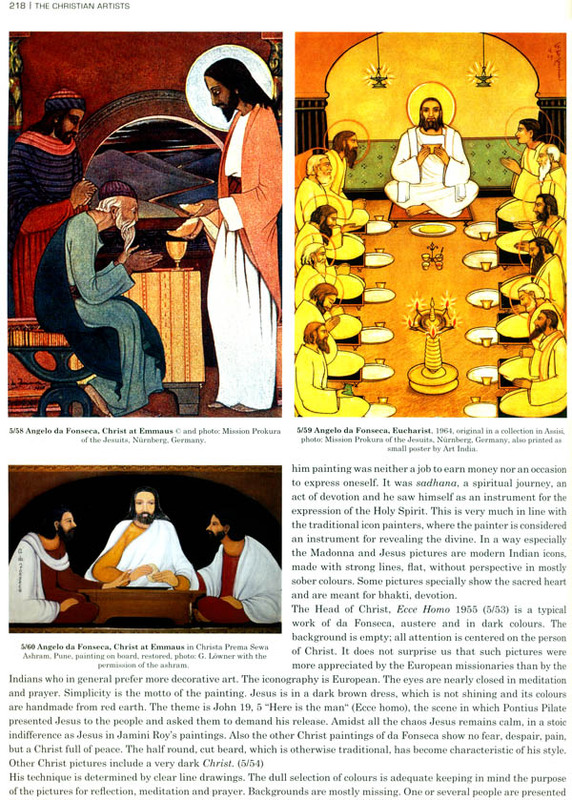 The fact that Hindu and Muslim artists without any obligation or commissions take to Christian themes today must be regarded as a great compliment to Christianity and as sign of a basically interreligious way of life. This openness and mutual enrichment in dialogue between orient and occident must be made public today, when religious fanaticism is threatening the life of minorities. 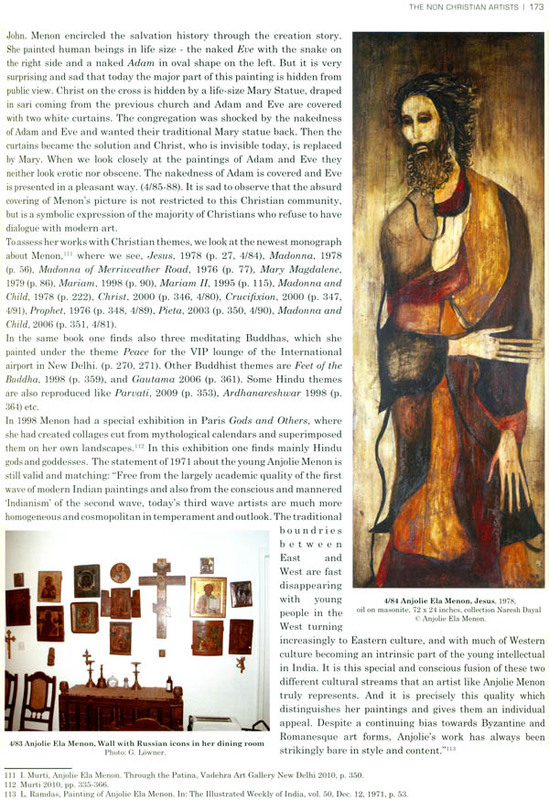 Christian artists who devote the majority of their work to Christian topics are unknown in the art market. They also do not attract much interest from their fellow Christians, as most of the Christians - if they have an interest at all in art — still prefer Western styles. 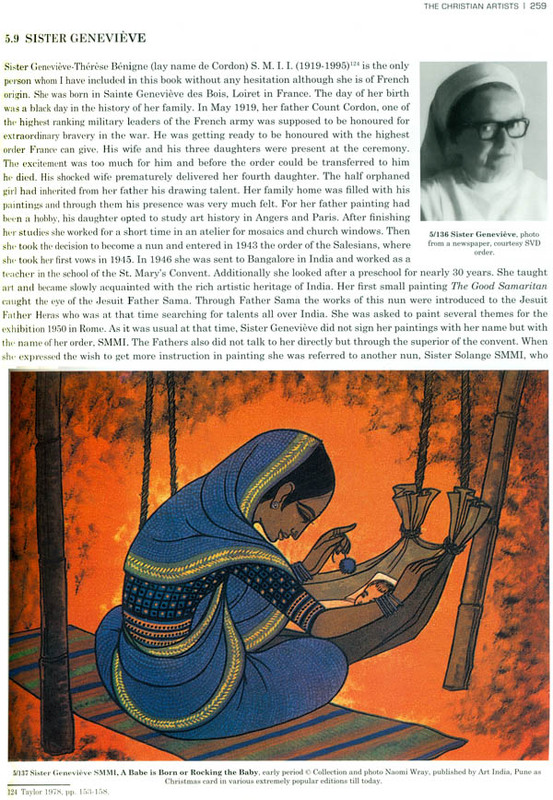 In the West some works of the Indian Christian artists with their exotic, new representations of the Good News are very welcomed. Such artists are also included here as they have a mission to the West. Although art includes so much, we have limited ourselves here to paintings, sculptures and architecture. 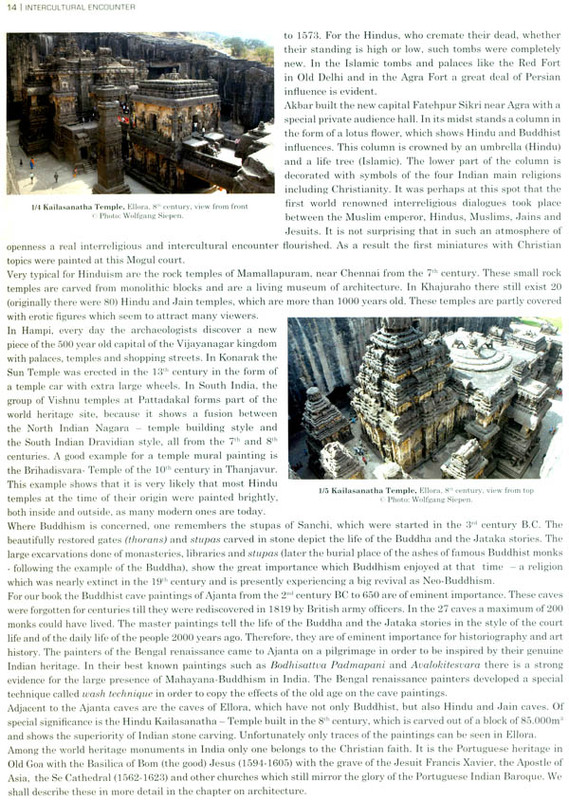 The short summary about Indian Christian architecture, which Anand Amaladass has prepared, could itself take the space of a whole book. 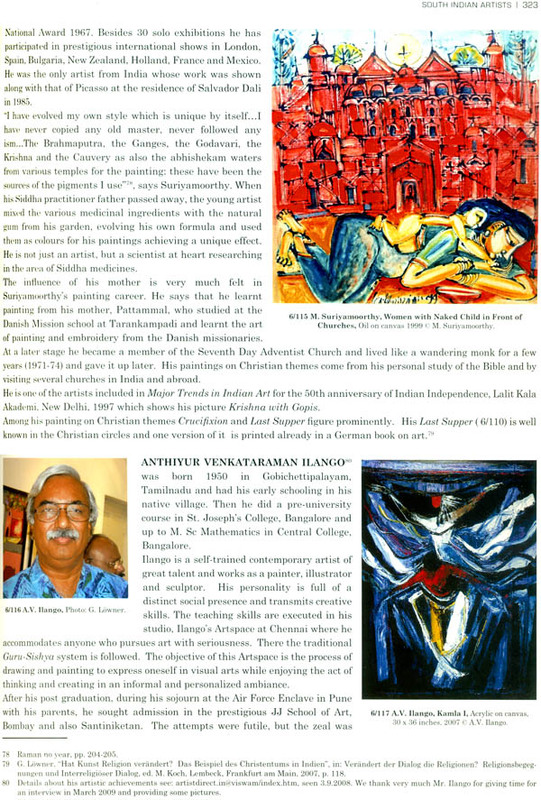 He also wrote about South Indian artists and popular Christian art. 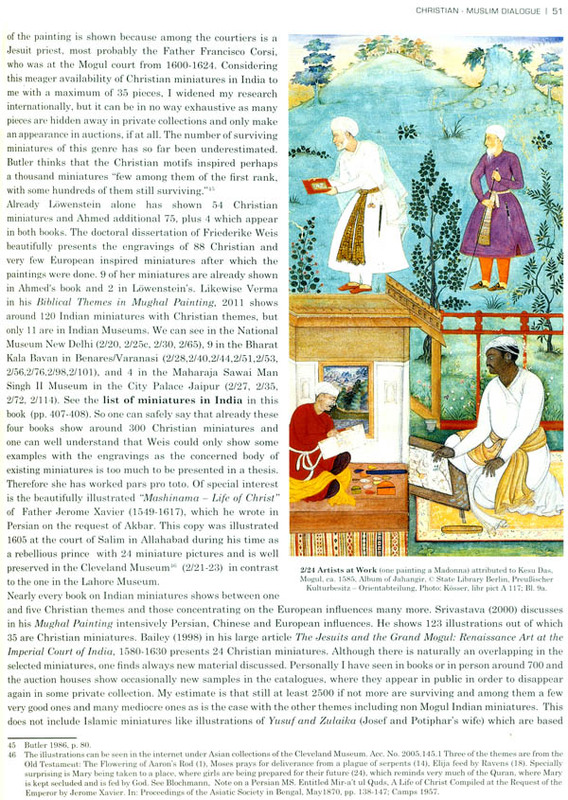 The birth of Christian miniatures at the Mogul court and their influence on Indian miniature art in general is another vast theme and was written by Gudrun Lowner who also did the beginnings of the intercultural encounter the Bengali artists the non Christian artists most of the Christian artists and Indian stamps with Christian themes. We are especially grateful for all the support extended by Mrs. Naomi Wray USA an artist and former missionery of the Methodist church. She has very kindly written the articles about Vinayak S. Masoji and Frank Wesley. The book is the result of many years of research on the part of both authors. Gudrun Lowner has devoted the last three years full time to this project. Without the repeated support of the Fritz Thyssen foundation, Cologne/Germany and the Omnis Religion foundation, Nachrodt/Germany it would not have possible to finish the research for this publication. Gudrun Lowner has authored a short version of this book in German and we thank the Lembeck Publishing House in Frankfurt for using some parts of it here. A great deal of expenditure was involved in order to collect the pictures get the copyrights from the museums to hold the interviews etc. we would not have been able to acquire all this if we did not receive the generous support of Dr. Ambrogio Bongiovanni, President, Francis Xavier Movement, Caserta, Italy, Mission Aachen, Germany and of several Jesuit Mission organizations. We acknowledge with great thanks the financial support of the Fritz Thyssen foundation, Cologue, Germany and of the association of protestant Churches and mission in Hamburg/Germany (EMW) towards meeting the coasts of printing. We would like to thank all the artists and their families who supported our research name all of them here but they are named in connection with the pictures specially we would like to mention the continued support of the German ambassador Bernd Mutzelburg and his wife the present German Ambassador Thomas Matussek the Swiss ambassador philippe Welit the artists Prof. Dr. Alphonso Arul Doss, Chennai, Fr. Joe Ubelmesser SJ, Nurnberg, Germany, Prof. Dr. Leonard Fernando SJ and the Staff of Vidyajyoti College, Delhi and its library. Prof. Dr. Leopold Correya SJ, Loyola College, Chennai Prof. Dr. Ignacimuttu SJ, Loyola College Chennai, Dr. Saju George SJ, Kolkata Prof. Dr. Theo Sundermeier From the Heidelberg University/Germany and Prof. Dr. Henning Wrogemann from the Protestant University in Wuppertal/Germany. 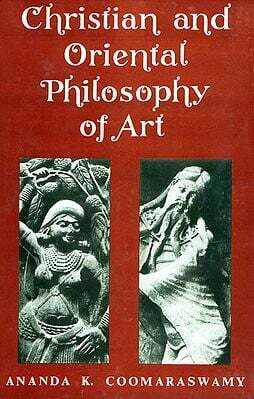 Without the technical help of the Indian Art collector Sara Abraham Pia Breunig, John David, Dieter, Dieter Heuer, Dr. Juuta, Jain Neugebauer, Roswitha Joshi, Sobana Narayan, Leela Samson and family Wojak Kwoka this reference book would not have been possible. We thank specially Anu Chopra New Delhi for her great technical help in the research Nissanka warakaulle in Colombo, Mr. George, New Delhi, Prof. Dr. Leonard Fernando SJ New Delhi Priseilla Flett, Wuppertal and Sara Schwering New Delhi for the Proof reading.